Add protection to your investment. We provide all year peace of mind by making sure your heat pump is properly maintained. If anything should go wrong you know we are here and ready to help. 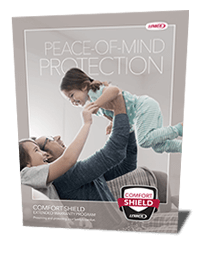 Our Comfort Shield Plans are a one time purchase and provides full coverage for up to 10 years from the original installation date. A qualifying pre-inspection is required to identify any deficiencies prior to the start of the coverage period.Comfort Shield Plans require annual maintenance for continued coverage benefits. Has your heat pump ever quit unexpectedly? When your heat pump stops working in the middle of a hot humid summer day or Freezing cold night you quickly realize just how much you and your family’s comfort depends on it, especially when the temperature reaches 90+ degrees inside your home! Unexpected heat pump repairs can be expensive! If you’ve ever had the displeasure of having to get your Heating, Ventilation, and Air Conditioning (HVAC) system repaired unexpectedly, then you know how costly they can be. Air conditioning companies usually add an overtime charge to their fees when making a service call outside of normal business hours…unless of course you’re covered under a preventive maintenance agreement. No Non-warrantee Parts – A Compete Care claim is limited to the deductible or to a minimum service fee. Out of Warrantee Coverage – Add to ANY existing residential heat pump under 5 tonnes & less than 10 years old. Priority service – We will be there when you need us. 24/7. Peace of Mind – No more worry that your heat pump is not covered. Incidental Costs of Repairs – vacuum pump fees, welding fees, reclaim fees and environmental disposal fees of refrigerants. Fully Transferrable – New Homeowners can enjoy the balance of your coverage. Get the peace of mind that comes with industry leading service and support. We will answer any questions you have about our Comfort Shield HVAC Warranty.